Note: You can enter this giveaway two (2) times per e-mail address per day. Deadline is 11:59PM ET 4.3.19. A sleek professional set of knives for slicing and dicing your kitchen masterpieces. The set includes a 8” chef knife; 8” bread knife; 7” santuko knife; 5” utility knife; 3” pairing knife; and a 4.3” filament block. 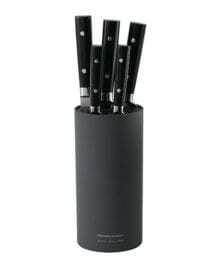 The black handled knives are perfectly balanced with stainless steel bolster and rivets. While they won’t stop the tears when you’re cutting onions, they’ll sure make the job easier and quicker. To show off your mad kitchen skills, make a lovely and simple onion thyme tart appetizer that induces sighs with its crispy flaky crust, sweet caramelized onions, and earthy herbs. So good. NO PURCHASE NECESSARY TO ENTER OR WIN. Void where prohibited by law. Open to legal residents of the 50 U.S., D.C. and Canada (excluding Quebec) who are at least eighteen years old at the time of entry and have internet access. Begins on 2.6.19 at 12:00:00 a.m. ET and ends on 4.3.19 at 11:59:59 p.m. ET. To enter the giveaway, submit your full name and email address on this form. Odds of winning this giveaway depend on the total number of eligible entries received. Only two (2) entries per email address per day. Sponsored by Leite’s Culinaria, Inc. For more information, visit our Official Rules. Be sure to add giveaways@leitesculinaria.com to ensure notification if you are the winner.